Our research led us northeast to the domaine of Françoise and Denis Clair in the village of Santenay. Denis Clair, quick with a laugh and a textbook bon vivant, created the domaine in 1986. The Clair family had owned parcels in the area for generations but sold most of their production to négociants. Denis set out to bottle his own wine. His wife Françoise was born in Saint-Aubin, a neighboring AOC village 2 1/2 miles to the northwest (a bit longer by car). 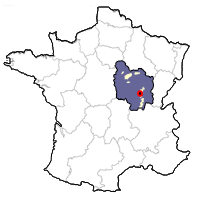 This is where the Clairs' winery is located. 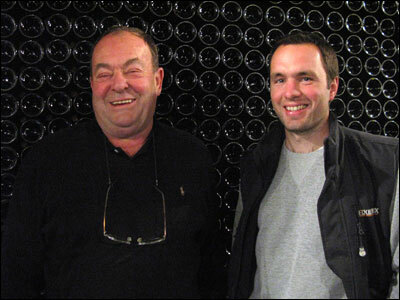 They have a son, Jean-Baptiste, who joined the family business in 2000 working the vines. Jean-Baptist eventually began making their white wines. Today the family owns 15 hectares, including parcels in Santenay and Saint-Aubin. They sell 75,000 bottles a year, with about 75% of that going abroad. Most of the Clair's nine Santenay hectares of vines are for reds. These wines, with nearly full destemming and an extended cold macération, enable the family to get plenty or richness while retaining a sense of elegance. 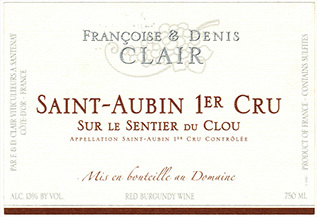 Its clay and limestone soil is deeper and has more clay than Saint-Aubin. The soil here is terre blanche — limestone and crushed limestone, along with some clay. The couple used proceeds from their terrain in Santenay to buy and rent Chardonnay parcels in Saint-Aubin. They own five hectares of vines there. Yields average 45 hl/ha for reds, 50 hl/ha for whites. No herbicides or pesticides are employed. The soils are worked with a plow so that they can limit their use of weed killer. An effort is made to work as organically as possible, but in very rainy years, like 2012 and 2013, some synthetic sprays were employed. The wines are fermented using indigenous yeasts. The reds are punched down and pumped over. All of the wines go through malolactic fermentation. The whites are fined and lightly filtered. The reds are lightly filtered, if necessary. Only one bottling is done per year at the domaine, normally 15 to 18 months after the harvest. The dose of sulfur is 20-25 mg/l for the reds and 30-35 mg/l for the whites. The parcels that go into this wine come from various vineyards around the village, with different expositions, which leads to the wine's complexity. Clay and limestone soil. 35 year-old vines. Manual harvest. Fermentation and malolactic in barrel, with 15% new oak. Approximately 10 months elevage. 13% alcohol. 3,500 bottles produced. Food Match: Great with cold chicken salads, grilled fish or fish with a light sauce. Tasting Notes: Very rich and fruity, very open aromas. Good balance, with nice finishing acids that lift the fruit. This comes from a parcel of vines in the middle of the slope above Saint-Aubin that faces south. White limestone soil with very little clay. 15 year-old vines. Harvest is by hand. The grapes are not destemmed but are lightly crushed. Fermentation in barrel where the wine also undergoes malolactic. 15% new oak a year. The wine stays in barrel for approximately 10 months. 13% alcohol. About 6,000 bottles are made a year. Food Match: Lovely at the table with salmon tartare or a warm goat cheese salad. Tasting Notes: Complex floral aromas along with fresh citrus (pineapple, lemon) and vanilla notes. Lovely balance with rich fruit and finishing underlying minerality. 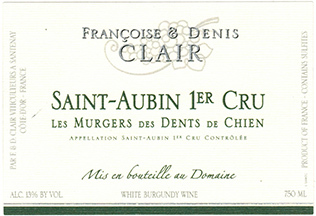 This wine comes from a well-situated parcel on the slope above Saint-Aubin, just above Gamay and along the border of Murgers des Dents de Chien. The vineyard faces southwest. The soils are clay and limestone. One third of the vines are 50 years-old, but two-thirds were replanted 5 years ago. Harvest is by hand. This cuvée is also barrel fermented, using 25% new oak. Malolactic fermentation also happens in barrel. The élevage lasts 10 to 15 months, depending on the vintage. 13% alcohol. About 3,000 bottles are made a year. Food Match: This makes a nice match for fish in sauce. Tasting Notes: Very aromatic, where ripe fruit and bright acidity harmonize. The wine is not only complex but also very long. This parcel lies along the plateau that contains the grand cru and premier crus of Puligny Montrachet, facing due south. The soil is shallow and very rocky, with lots of limestone. Half of the vines are 60 years-old, the other half 20 years-old. Harvest is by hand. Fermentation and malolactic in barrel, 20% of which is new. 10 month élevage. 13% alcohol. 7,000 bottles produced. Food Match: A good match for lobster, shrimp or rich white fish. Tasting Notes: Notes of exotic fruit, white flowers and citrus fruit. Fine texture. Very long and refined. This southern-facing parcel is located above the village in the middle of the slope. Very rocky limestone with a little clay in the soil. 45 year-old vines. Harvest is by hand. 90% of the grapes are destemmed. Grapes are sorted in the vineyard during harvest, then destemmed and fermented in cement tanks. Cold maceration for 10 days to extract color, with daily punch downs and pump overs. Alcoholic fermentation takes place during 8 days. Depending on the vintage, the wine is blended with the press wine. 2/3 is aged in tank, and the rest goes into barrels, 10% of which are new. Malolactic fermentation takes place in both tank and barrel. 4,000 bottles produced. Food Match: A good partner for white meats, beef kebabs or mushroom dishes. Tasting Notes: Plenty of notes of red fruits on the nose, and nice balance of fruit and tannin on the palate. Good length.